This article is about Bismarck (disambiguation)|Bismarck. For other uses, see Bismarck, North Dakota (disambiguation). 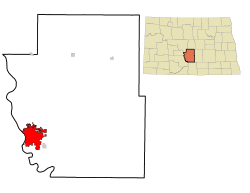 Bismarck (/ˈbɪzˌmɑːrk/) is the capital of the U.S. state of North Dakota and the county seat of Burleigh County. It is the second-most populous city in North Dakota after Fargo. The city's population was 61,272 at the 2010 census, while its metropolitan population was 129,517. In 2015, Forbes magazine ranked Bismarck as the seventh fastest-growing small city in the United States. 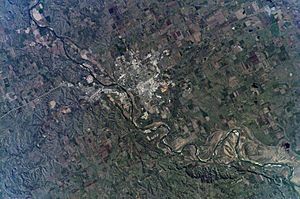 Bismarck is located across the river from Mandan, named after a historic Native American tribe of the area. The two cities make up the core of the Bismarck-Mandan Metropolitan Statistical Area. Bismarck is located at (46.813343, −100.779004). According to the United States Census Bureau, the city has a total area of 31.23 square miles (80.89 km2), of which, 30.85 square miles (79.90 km2) is land and 0.38 square miles (0.98 km2) is water. 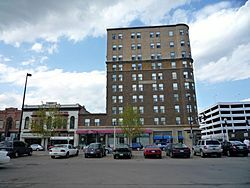 The city has developed around downtown Bismarck, the center of historic development. It is distinctive because the city's major shopping center, Kirkwood Mall, is located in the center city rather than in the suburbs. Several other major retail stores are in the vicinity of Kirkwood Mall, which was developed near the Bismarck Civic Center. The two Bismarck hospitals, St. Alexius Medical Center and Sanford Health (previously Medcenter One Health Systems) are both downtown. The streets are lined with small stores and restaurants, providing numerous amenities. Much recent commercial and residential growth has taken place in the northern section of the city, largely because of expanding retail centers. Among the shopping centers in northern Bismarck are Gateway Fashion Mall, Northbrook Mall, Arrowhead Plaza, and the Pinehurst Square "power center" mall. 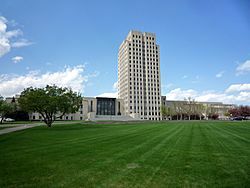 The North Dakota State Capitol complex is just north of downtown Bismarck. The 19-story Art Deco capitol is the tallest building in the city and the state, at a height of 241.75 feet (73.69 m). The capitol building towers over the central part of the city and is easily seen from 20 miles (32 km) away on a clear day. Completed during the Great Depression in 1934, it replaced an earlier capitol building that burned to the ground in 1930. The capitol grounds house the North Dakota Heritage Center, the North Dakota State Library, the North Dakota Governor's Residence, the State Office Building, and the Liberty Memorial Building. The North Dakota State Penitentiary is in eastern Bismarck. The Cathedral District is an historic neighborhood near downtown Bismarck. The neighborhood was named after the art deco Cathedral of the Holy Spirit. Some homes in this neighborhood date to the 1880s, although many were built in the first decades of the 20th century. At times, the city has proposed widening the streets in the neighborhood to improve traffic flow. Many residents object because such a project would require the removal of many of the towering American elms which line the streets. These have escaped the elm disease that destroyed street canopies of trees in Eastern cities. The warmest month in Bismarck is July, with a daily mean of 21.3 °C (70.3 °F), with typically wide variations between day and night. The coldest month is January, with a 24-hour average of −12.1 °C (10.2 °F). Precipitation peaks from May to September and is rather sparse in the winter months. Winter snowfall is typically light to moderate, occurring with the passage of frontal systems; major storms are rare. The top six ancestries in the city are: German (57.9%), Norwegian (18.2%), Russian (7.7%), Irish (7.2%), English (5.0%), Swedish (4.3%). One of the main tourism attractions of the Bismarck area is Fort Abraham Lincoln State Park, located 7 miles (11 km) south of neighboring Mandan, North Dakota. It contains the partial reconstruction of Fort Abraham Lincoln, the headquarters of the 7th Cavalry and last command of General George Armstrong Custer before the Battle of the Little Bighorn (also known as the Battle of the Greasy Grass). The park includes On-a-Slant Village, a partially rebuilt earth lodge village that was once occupied by people of the historic Mandan tribe. Guided tours of both sites are offered in the summertime. There are also a museum on park history, nature trails, and a campground. 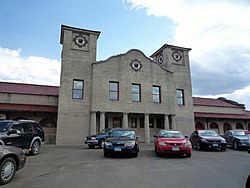 The historic Northern Pacific Railway Depot, built in 1901 using the Mission Revival style. The building has been adapted for use as a Mexican restaurant. Bismarck, North Dakota Facts for Kids. Kiddle Encyclopedia.